How could fierce, stylized wrangling about centuries-old religious doctrine-by monks, no less-seem as if it involves the exercise of an autonomous, critical rationality, a faculty akin to the one celebrated in the European Enlightenment? To appreciate how debate can exhibit attributes of the liberal subject and become a diasporic pedagogy-a means by which Tibetan refugees can avoid blind faith and protect their religious patrimony from the challenges of exile-we must first appreciate what debate does within the confines of a monastery. At Sera Monastery in India, debate's drama, where the defendant tries to save Buddhist doctrine from challengers who threaten it, becomes a coherent ritual drama not just because it is crafted a certain way but by virtue of the way this practice has been "placed" within a complex assemblage of discursive and educational practices, which range from daily memorization routines to the habitual ways in which monks physically handle their books. This means that the very question of what debate does at Sera-to say nothing of what it does in the diaspora in India-demands a detour. Let us therefore postpone consideration of debate for the moment and work from the outside in, beginning, as I began, with a critical feature of Sera's landscape, its division into two monastic colleges: Sera Jey and Sera Mey. Visually and from afar, Sera Monastery in South India-a sprawl of buildings and residences located near a bend in the Cauvery River and the town of Bylakuppe-shrinks into a compact, scintillating gilt-roofed jewel. Encircled by a sea of maize and grass, it looks whole and pacific, or did to me. By auto-rickshaw I would snake up the roads that extend from the neighboring towns of Bylakuppe or Kushalnagar, and pass into Sera's premises through a singular, ornamental gateway-suggestive, again, of a monastic settlement with a monolithic identity. Here, the visual landscape conspires with the lexicon, for perhaps nowhere is Sera's cohesiveness more conspicuous than in the words for its parts. Take the names for Sera's primary administrative units: 'monastery' (dgon pa) (syn. 'monastic-seat' gdan sa), 'college' (grwa tshang), 'regional house' (khang tshan). Gather these lexical items into an institutional partonymy, asking of each, "Is x a part of y?" and an elegant Matryoshka-like whole snaps into view. Regional houses nest into colleges, and colleges into monasteries, so that Sera's two colleges, Sera Jey and Sera Mey, look "equivalent." And once they are subsumed as equal parts within a single corporate body, it does not take much to imagine them enjoying a friendly, fraternal existence. At first I could barely see Jey and Mey. Little signage distinguishes the two, and the colleges' perimeters are not staked out with obtrusive fences, walls, or paths. Many regional houses of Jey and Mey, I discovered, stand side by side, as if seamlessly integrated. Nor do monks broadcast their college affiliation through dress, badge, or comportment. No legible clothing or garish emblems of group membership. Monks of Jey and Mey brush by each other on the road, dressed in indistinguishable maroon robes. And Sera boasts just one major circumambulation route on its premises. At dusk, a brisk current of monks from both Jey and Mey eddies clockwise around the route in a scuffling whirl of casual talk and murmured mantras, set to time by the click of prayer beads counted off with thumb and forefinger. As weeks pass and more Jey and Mey structures come into relief, I begin to feel an odd sense of redundancy about this veritable town, peopled by some 4,500 monks. It is not just that each of the monastery's two colleges has its own semiautonomous administrative apparatus, its own 'abbot' (mkhan po), 'disciplinarian' (dge skos), 'financial officer' (phyag mdzod), and so forth. Nor is it just that each boasts its own central assembly hall, debating courtyard, fleet of regional houses, and secular schoolhouse. For nearly every imaginable category of building in this townscape-library, bookstore, phone station, publishing center, restaurant, general store-there is (at least) one allocated for Jey and another for Mey. The buildings in Sera's townscape are divisible by two, with little if no remainder. And this integrated but divided townscape comes with unambiguous loyalties of patronage and consumption. I had chosen Mey and felt the consequences at once. On my first visit to Mey, I decided to explore the libraries of both colleges and shared these plans casually with a senior Mey monk. His response was dampening. Sera Mey's library is 'better' (yag ga). It would be a 'sin' (sdig pa) to go to the Jey library. Goods ought to be purchased from one's own general store, calls placed at one's own phone center, food eaten at one's own restaurants, and so on, so that there is little question of where the best momo (steamed meat dumplings, a traditional delicacy and a weakness of mine) is found, though I once posed the question to Pasang, ten years of age and new to Mey, who responded without hesitation: 'Norling restaurant.' I had heard Norling was a Mey restaurant and pressed: 'So Jey college has no good momo?' Pasang stiffened, nonplussed by my stupidity. Jermey, an adolescent monk standing nearby, responded for him: 'There's no need to go to Jey restaurants. There are [already] Mey restaurants'. I find Pasang vrooming a black matchbox car along the surface of the flat concrete roof of his two-story regional house. It's quiet up there, and the brick balustrade makes a great highway. He got the car free from a bag of Milky Bar chocolates but had been saving for a real purchase. Would I like to see the new set of wheels he's thinking of buying? he asks, a question he rattles off with the velocity and matter-of-factness of someone with a serious avocation. He adds that he's just finished storing up 105 rupees. Sure, I say weakly, worrying what my participation will mean. I am whisked away to a cramped Sera Jey-owned-and-operated general store the size of a large shed, located meters from his regional house. Gesturing his way through a thicket of items behind the counter, Pasang picks out a foot-long battery-operated "Tour Autobus" whose price tag is 105 rupees. Inside sits a driver with a blue body and beige head. In the passenger seat sits a woman, smaller, stuck with the job of waving to passersby. The two Jey monks who man the store spring into action, volunteering a demonstration, a test drive, and this scene unfolds far too fluently to have been the first. One monk plants a few massive D batteries inside a bay and flips a switch. The Tour Autobus, a Bump and Go, jounces to life and hurtles blindly forward, careening into walls as it issues a grating, metallic rendition of "It's a Small World." Small, that's how Sera felt at that moment. No trace of collegiate allegiance and antagonism here. For monks like Pasang in the early stages of socialization, the commitment to patronize one's college may not be fixed and categorical, but for well-socialized monks the townscape of Sera Monastery-with its dual administrative apparatus, its parallel buildings, its collegiate loyalties-is divided. A line between Jey and Mey is drawn, and monks should not cross it. Pasang never told me whether he ended up buying the bus, but one day I began to hear its bleating song blocks away. As the batteries wore, the tune warped and slowed till, finally, I never heard it again. Intercollegiate polarization is nothing new. For the Geluk monastic seats of Tibet, "a monk's loyalties were primarily rooted in his college" (Goldstein 1998:20). And rooted deep, it would seem, as often illustrated by the 1947 Sera Jey uprising against the Tibetan central government. Mey had aligned itself with the Tibetan government in a dispute over the regency of the fourteenth Dalai Lama and did not come to the defense of its neighbors, nor was it targeted by government troops. When Jey's walls were shelled the Mey college remained unmoved. Though collegiate loyalties have not been tested in so dramatic a fashion in exile, Mey was swept up in controversy surrounding the propitiation of the deity Dorje Shugden, held by the Dalai Lama to be a hazardous practice. The Dalai Lama began to oppose the practice in the 1970s, and events came to a head in February 1997 with the murder of Shugden critic and longtime confidant of the Dalai Lama, Geshe Lobsang Gyatso, the seventy-year-old founder and principal of the Institute of Buddhist Dialectics in Dharamsala. He was discovered in a pool of blood near his two slain monk-assistants, each stabbed more than a dozen times. Indian police and those at Dharamsala believed the murderers to be Shugden devotees. Sera Mey's large Pomra regional house had a number of monks who refused to abandon the deity, and tensions persisted with Dharamsala, which in turn exacerbated tensions between Jey and Mey. While binding past to present is not what I intend here, intercollegiate polarization has been and remains a vital institutionalized feature of the Geluk monastic seats in South India. The importance of these divisions is suggested by comments about their loss and restoration in exile that surface in oral narratives about the critical Buxa decade before the Geluk monastic seats were constructed in South India. Buxa Duar is situated in the district of Jalpaiguri, in Northwest Bengal, near the Bhutanese border. It had been one of the main arteries and old trade routes into Bhutan and was the site of an ex-British fort and prison. Taken by the British during the Anglo-Bhutanese Duar war of 1864-65, the fort housed political dissidents during India's independence movement, including several who participated in the Civil Disobedience Movement of 1930. After the Quit India movement of 1942, Buxa ceased to function as a prison and served instead as British barracks, till independence. Barbed wire still haunted the camp's perimeter when the Tibetans arrived, and the irony of inhabiting a former prison, especially one that had housed freedom fighters, was not lost on the new occupants. It was one of the first things veterans would tell me about Buxa. Much about Buxa made its refuge feel like incarceration. Located on a ridge encircled by three densely wooded hills, the camp suffered from stifling heat and pounding monsoon rains. A lone road stretched from Langapara, the nearest town, and wound its way to the remote site. As a news correspondent observed in 1968, "Immediately below the camp a signboard says ironically, 'To Lama Ashram and Police Office'" (Central Tibetan Administration 1968:2). An Indian commandant manned a station at the entrance. Permits slowed entry and departure. It was hard for visitors to get in, and for residents to get out. Buxa initially served as a transit camp for Tibetan refugees arriving in India via Bhutan in 1959. In September 1959 a weeklong meeting among representatives of the major sects of Tibetan Buddhism was held in Kalimpong in West Bengal. There they worked out the details of a plan to transfer to Buxa some of the monks who had made it into exile. Fifteen hundred were to be accommodated at Buxa, three hundred of whom were allocated for Sera's two monastic colleges, Jey and Mey. Having recognized that Buxa would be trying-the heat alone was proof of that-a couple hundred Buxa monks who had belonged to Tibet's Upper and Lower Tantric colleges, many of whom were senior members, were relocated to the cooler slopes of Dalhousie in 1959. It was still a privilege to stay at Buxa. Entry was not automatic. A rudimentary screening process ("What level of study did you reach? What texts did you read? Were you disciplined?") filtered out all but the minority of monks who had actually studied philosophy in Tibet; those who made the list escaped road construction work. Buxa was meant especially for monks whose studies had been interrupted by exile; most were rather young, and there was a relatively small number of lamas and senior scholars, enough to tutor and provide instruction. Buxa became "Buxa Lama Ashram" and would serve as a temporary settlement in which the shoots of Tibetan Buddhism would take root. This monastic community would then be transplanted back to Tibet when independence was won. Or so the plan went. The hardships of the Buxa decade occupy a special place in the memory of senior Geluk monks. Their recollections circle around recurrent themes: heat, ghosts, suicide, abject poverty, the scourge of tuberculosis, the acute mental anguish of not knowing when, or if, one would return to Tibet. A series of jagged images-like "frozen slides," as Veena Das (2000:61) observed in an essay on memories of the trauma and violence of India's partition-obtrude from these oral narratives: razors that ended the lives of a few; a beam from which a monk was found hanged; the icy body of a local South Asian teenager who worked at Buxa, discovered facedown in a bathing area, having drowned mysteriously, as mysteriously as the stones that clattered off rooftops but could never be found and had no human source; an absurd, motley assortment of donated clothes; sandals fashioned from tire rubber purchased for a rupee and a quarter (a shipment of nine hundred pairs of shoes arrived finally in January 1961); barbed wire and whispers of past torture; long, aimless walks in the hills that could free you for a while from the cramped quarters in which TB spread so virulently. "Beggars, that's what we were reduced to," one said, condensing his train of memories into a single, resonant figure. As the current principal of the Institute for Buddhist Dialectics in Dharamsala recounted-he, too, is a veteran of Buxa,-they were despondent at first, and that drained the life from study and debate. As they struggled to bring routine to their lives, monastic life in Tibet came to a sudden, violent halt. All of this made Buxa doubly important. Without it Tibet's religious patrimony, at least that of the Geluk sect, would be lost. Expectedly, the topography of difference within and between the Geluk monasteries was all but flattened in the early years at Buxa. Intercollegiate distinctions and allegiances once fortified by separate buildings and halls and courtyards were indistinct as monks shared the fate of displacement and inhabited a landscape not scripted to remind them of their differences. Sera's Jey and Mey colleges sought to reinscribe their differences in small ways almost immediately. Sera monks resided in several structures. Those of higher relative status-Geshes and reincarnate lamas-tended to live separately in bamboo dwellings that were constructed from materials from the neighboring forest. (That these were less than commodious was brought home to me by a senior monk, who drolly dubbed them chicken coops.) Several of the larger regional houses, like Sera Jey's Triu house, reconstituted themselves in separate bamboo dwellings. A large concentration of Sera's monks initially settled in a single structure, one of Buxa's old, long, rectangular buildings. It was a gloomy, dispiriting place. According to some oral accounts, most of Sera's monks-104 in all-roomed together here initially, 52 of whom were from Mey, 52 from Jey. The thick stone walls had narrow windows that sliced daylight into thin, frail shafts. Only later were these enlarged to let more light in. The building's interior had been left bare and hollow, though in some cases monks fashioned room dividers from bamboo and fabric. A door in the building's center conveniently gave the space bilateral symmetry, carving it into two equal halves, for Jey and for Mey. At each building's end were bathrooms that were demolished and renovated into makeshift altar areas on which offering bowls and each college's respective texts could be placed. Texts were scarce at first and had to be painstakingly reinscribed on whatever materials could be found, including labels peeled from powdered milk tins donated by international aid agencies. Early in their stay at Buxa, monks of all the Geluk monastic seats would frequently debate together in one area; only later were they able to establish separate debating courtyards as had existed in Tibet. Though the colleges had to share the same courtyard-Sera Jey with Mey, Drepung Loseling with Gomang, Ganden Shartse with Jangtse-they broke up into subgroups based on their college ties when they debated; at other times, they debated together, affording a degree of contact between the colleges that had occurred less frequently in Tibet. Other practices continued to presuppose the colleges' autonomy and distinctiveness, however. The daily tea assembly (mang ja), for instance, was convened by each college and led by each college's chant leader (dbu mdzad). If the boundaries between the units of 'colleges', 'regional houses', and perhaps even the monastic seats themselves, seemed at first indistinct, owing to the hardships faced at Buxa and the lack of a built environment that could reinscribe old distinctions, they would eventually be reinscribed, and quite durably so. Sera's move from Buxa to Bylakuppe in the early 1970s was no less disruptive. In terms of intercollegiate distinctions, the move southward was a step backward, for once again Sera's monks faced a new and relatively inhospitable environment, this time in the wooded environs of southern India. Collegiate and subcollegiate distinctions were again flattened as monks lived and labored under cover of tents while land was cleared. Though not without resources to the same degree as they were at Buxa, they were still struck down by illness and faced the daunting tasks of clearing untamed forest, preparing agricultural fields, and laying the foundation for a durable monastic community. The intramonastic distinctions were not wholly neutralized, of course, nor were the important regional house (khang tshan) divisions. Of the relative salience of the regional house distinctions upon first arrival in the south, for instance, one monk remarked: 'It was not as if [the regional houses] were non-existent' (med pa 'dra ma red). If asked, one would easily identify with one regional house, but the lack of a proper built environment hindered their visibility. The Jey and Mey monastic colleges and their subcollegiate regional houses came into sharp relief only in the 1980s, when new refugees from Tibet began to arrive, and when a wave of construction brought new, durable structures to the monastic settlement. As fitful as the monastic divisions had been from the Buxa period to the 1980s, their status since has been relatively stable. The Dalai Lama has represented Buddhism as a religion of non-violence, compassion, and world peace, but this does not reflect how monks learn their vocation. 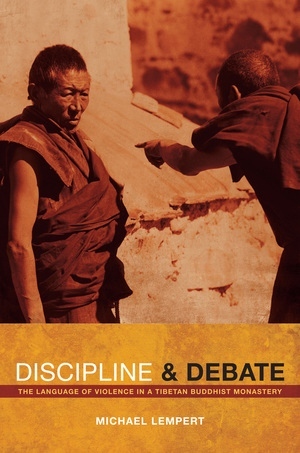 This book shows how monasteries use harsh methods to make monks of men, and how this tradition is changing as modernist reformers—like the Dalai Lama—adopt liberal and democratic ideals, such as natural rights and individual autonomy. In the first in-depth account of disciplinary practices at a Tibetan monastery in India, Michael Lempert looks closely at everyday education rites—from debate to reprimand and corporal punishment. His analysis explores how the idioms of violence inscribed in these socialization rites help produce educated, moral persons but in ways that trouble Tibetans who aspire to modernity. Bringing the study of language and social interaction to our understanding of Buddhism for the first time, Lempert shows and why liberal ideals are being acted out by monks in India, offering a provocative alternative view of liberalism as a globalizing discourse. Michael Lempert is Assistant Professor of Anthropology at the University of Michigan.